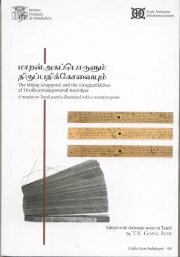 This book containes the first complete edition of a sixteenth-century Tamil treatese in 364 sutras about Tamil Love-Poetry, The poem illustrates the rule of the treatese, for it contrives to string together into a single narrative the various situations envisaged in the shorter love poems of classical Tamil literature of the Cankam age. It culminates in the amorous couple living as pious devotees of the devotees of Nammalvar, the poet-devotee of Vishnu. About the Author :T.V.Gopal Iyer, is one of the greatest living experts in this field. During his work for the Ecole francaise d`Extreame-Orient in relationship with the IFP over the last thirty years he has produced a number of outstanding text-editions, among them a 14-volume edition of the Tolkappiyam with all its commentaries.